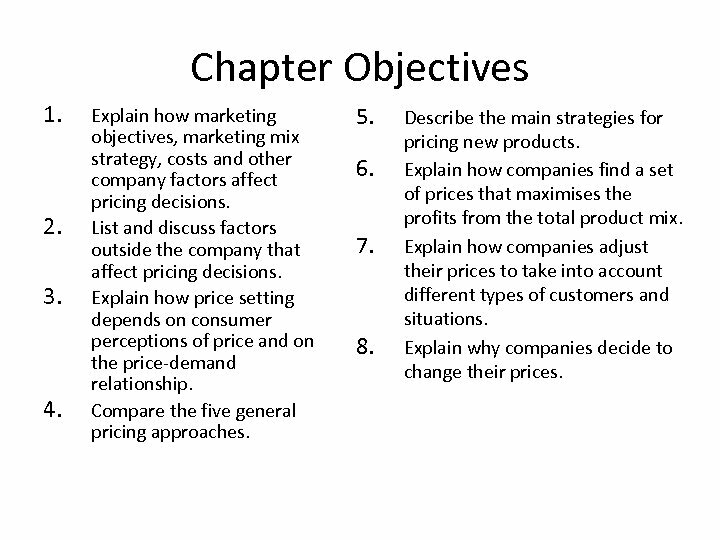 Chapter Objectives 1. 2. 3. 4. 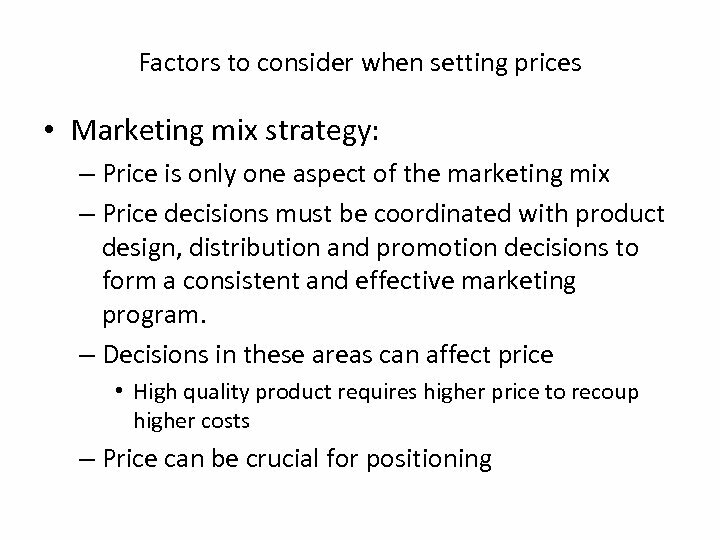 Explain how marketing objectives, marketing mix strategy, costs and other company factors affect pricing decisions. 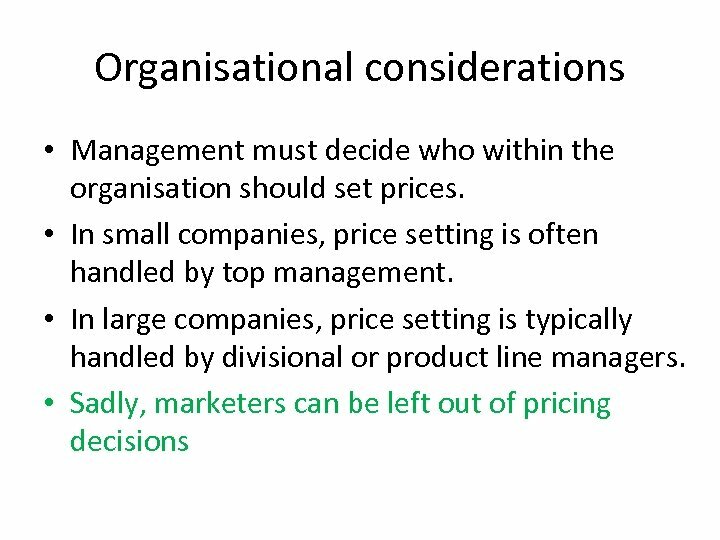 List and discuss factors outside the company that affect pricing decisions. 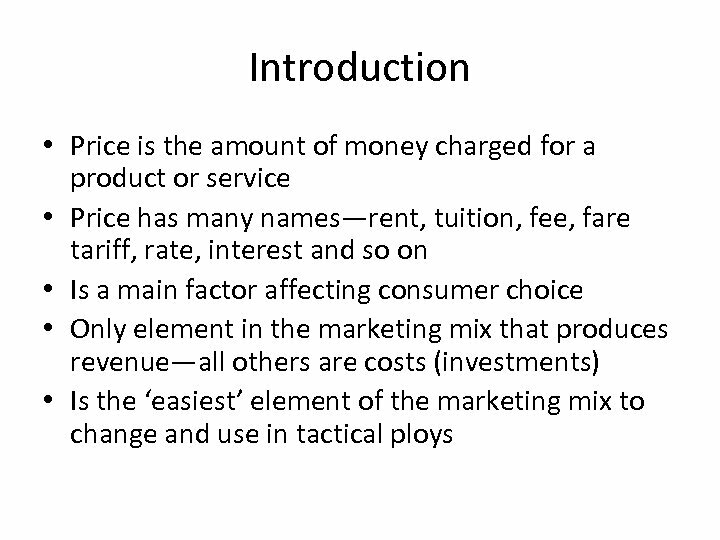 Explain how price setting depends on consumer perceptions of price and on the price-demand relationship. 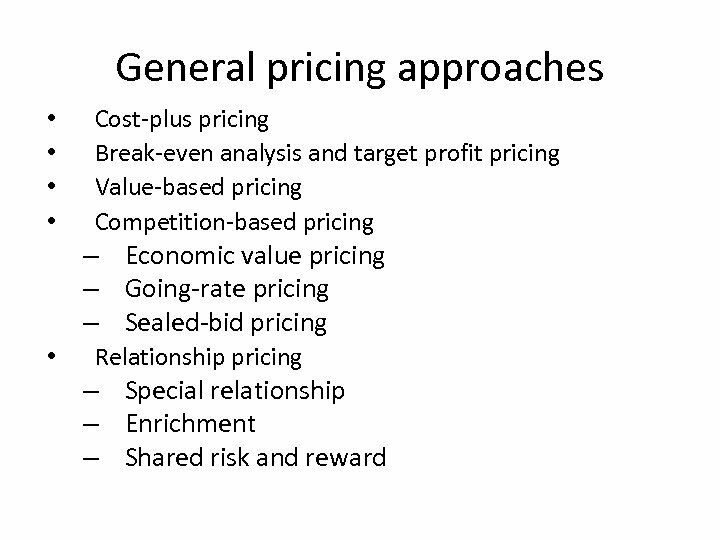 Compare the five general pricing approaches. 5. 6. 7. 8. 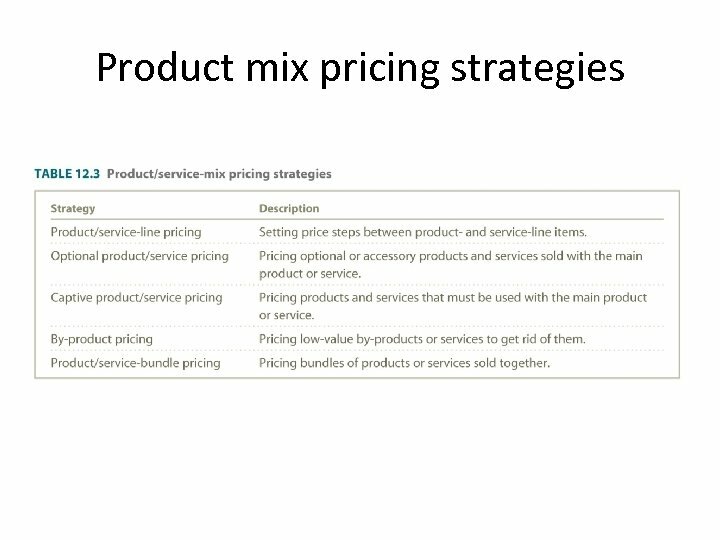 Describe the main strategies for pricing new products. 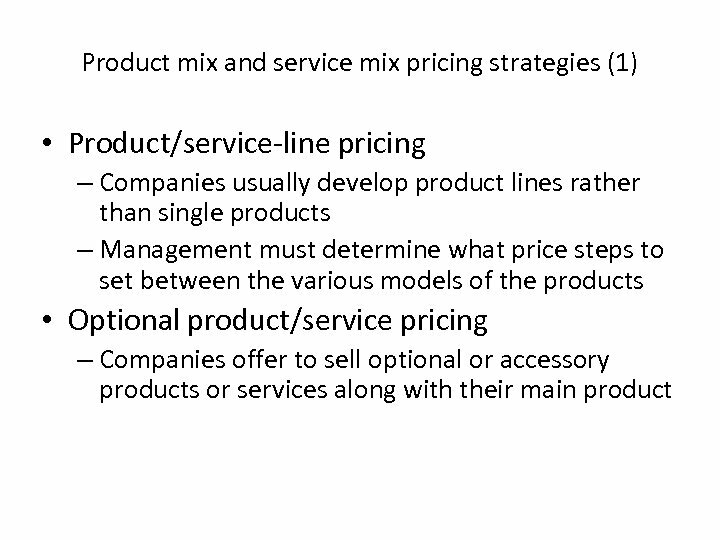 Explain how companies find a set of prices that maximises the profits from the total product mix. 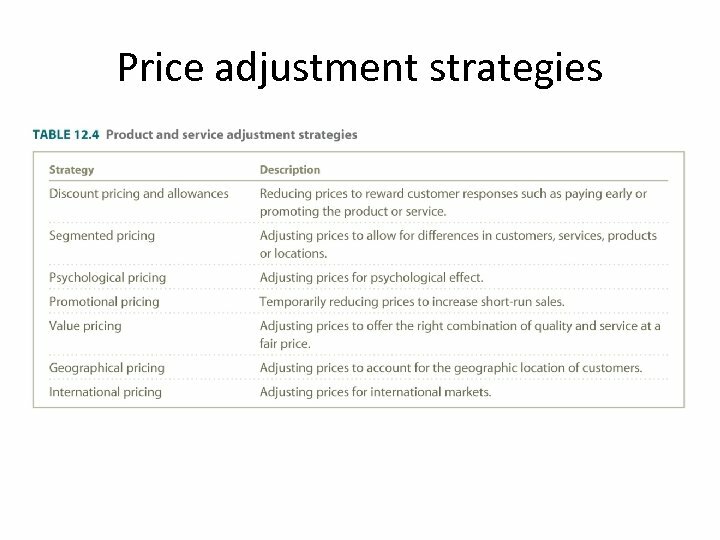 Explain how companies adjust their prices to take into account different types of customers and situations. 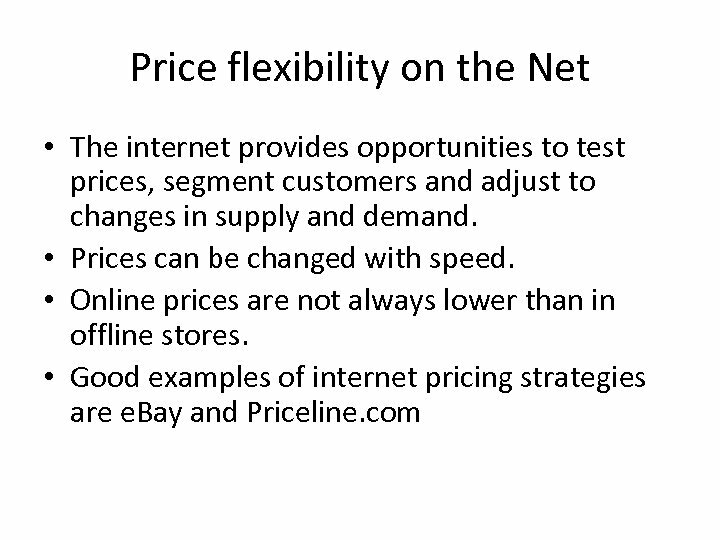 Explain why companies decide to change their prices. 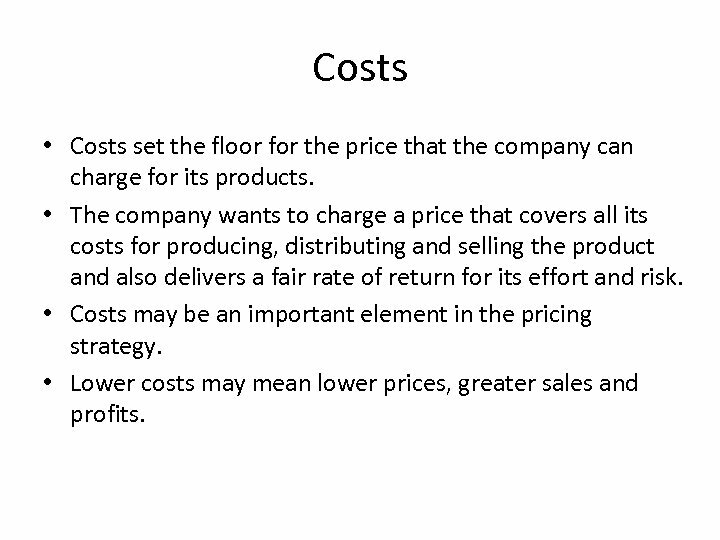 Costs • Costs set the floor for the price that the company can charge for its products. • The company wants to charge a price that covers all its costs for producing, distributing and selling the product and also delivers a fair rate of return for its effort and risk. 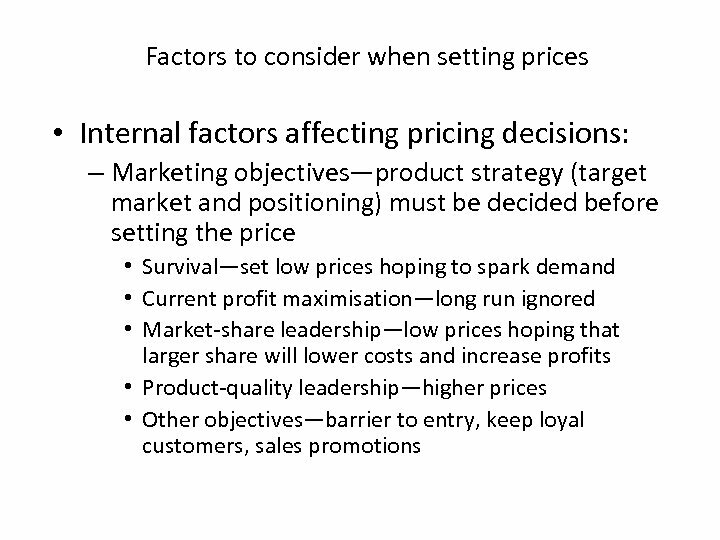 • Costs may be an important element in the pricing strategy. • Lower costs may mean lower prices, greater sales and profits. 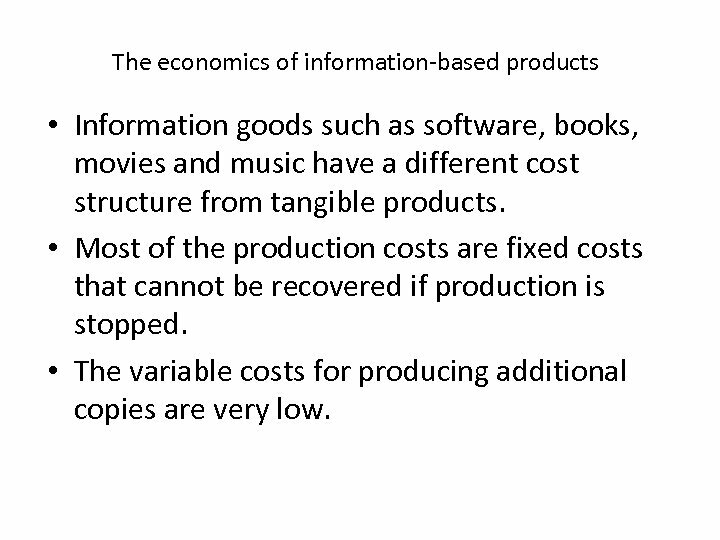 The economics of information-based products • Information goods such as software, books, movies and music have a different cost structure from tangible products. • Most of the production costs are fixed costs that cannot be recovered if production is stopped. • The variable costs for producing additional copies are very low. 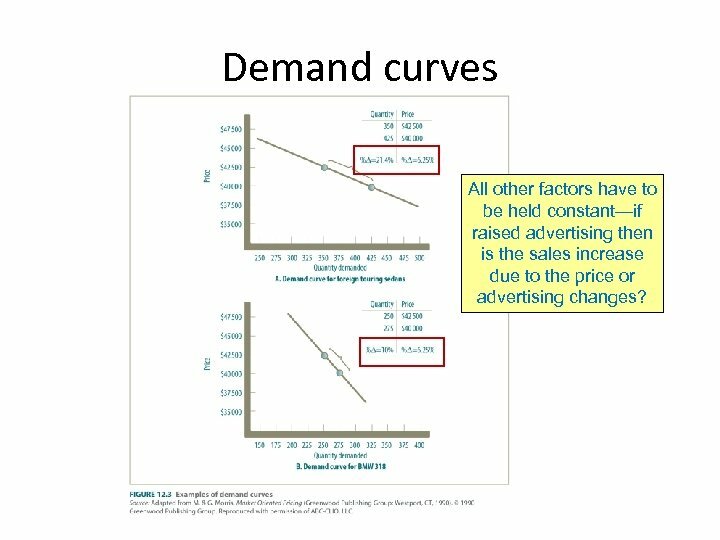 The market and demand • Pure competition: The market consists of many buyers and sellers trading in a uniform commodity. No single buyer or seller has much effect on the going market price. 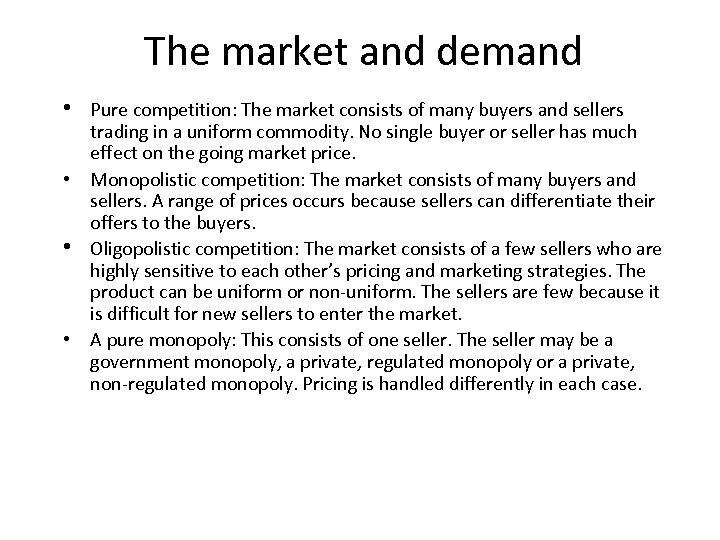 • Monopolistic competition: The market consists of many buyers and sellers. 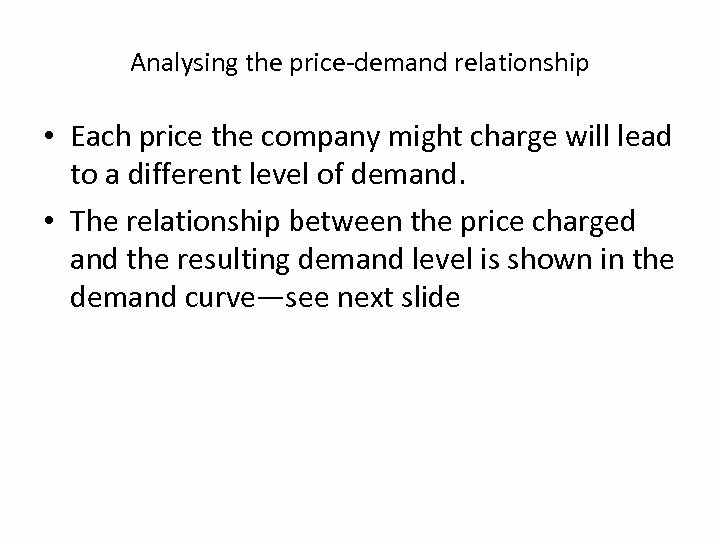 A range of prices occurs because sellers can differentiate their offers to the buyers. 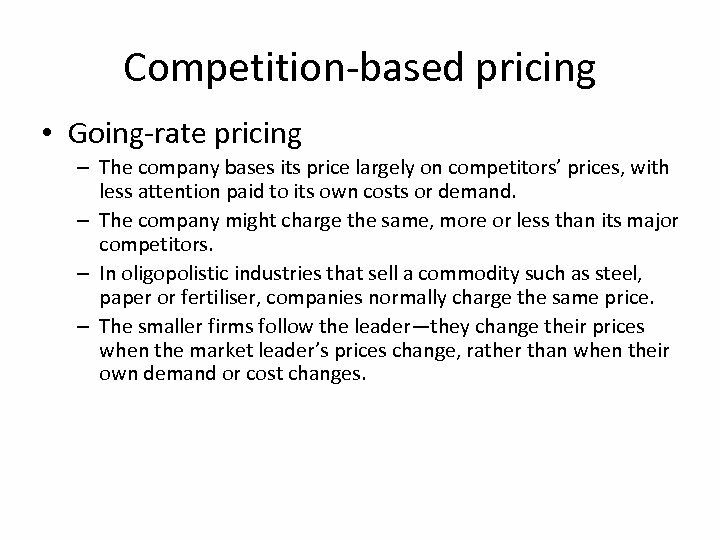 • Oligopolistic competition: The market consists of a few sellers who are highly sensitive to each other’s pricing and marketing strategies. The product can be uniform or non-uniform. The sellers are few because it is difficult for new sellers to enter the market. • A pure monopoly: This consists of one seller. The seller may be a government monopoly, a private, regulated monopoly or a private, non-regulated monopoly. Pricing is handled differently in each case. 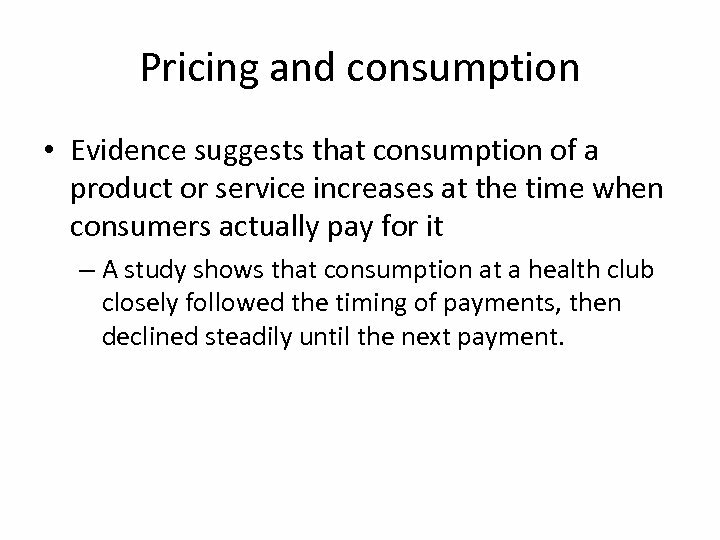 Pricing and consumption • Evidence suggests that consumption of a product or service increases at the time when consumers actually pay for it – A study shows that consumption at a health club closely followed the timing of payments, then declined steadily until the next payment. 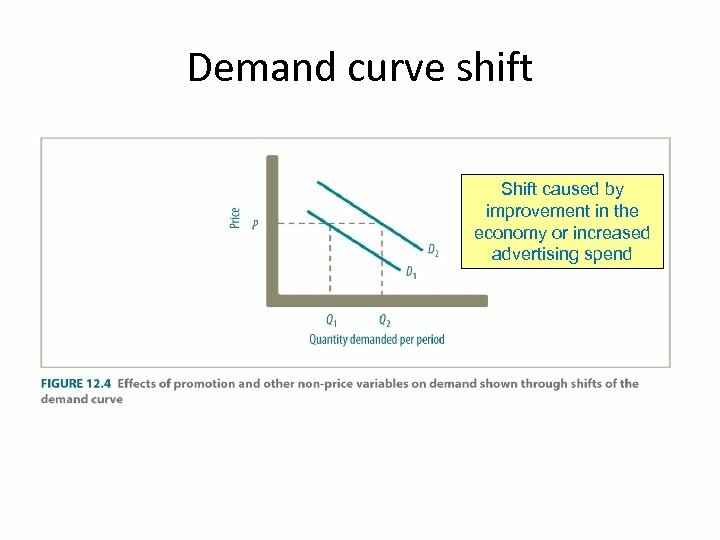 Demand curves All other factors have to be held constant—if raised advertising then is the sales increase due to the price or advertising changes? 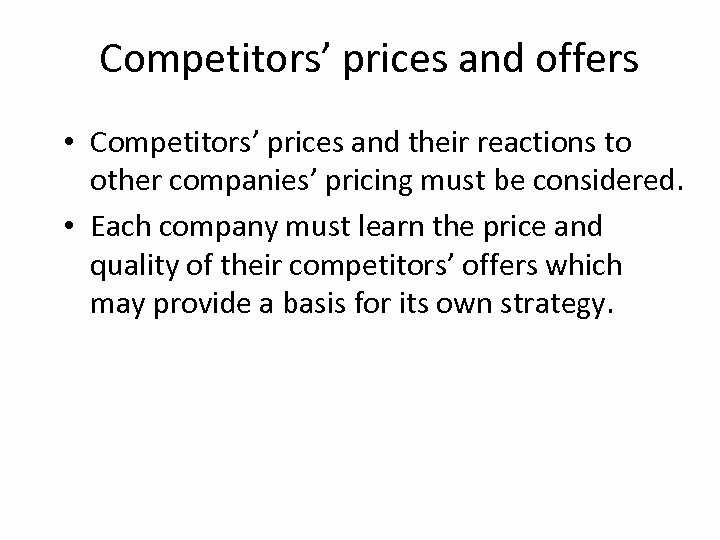 Competitors’ prices and offers • Competitors’ prices and their reactions to other companies’ pricing must be considered. 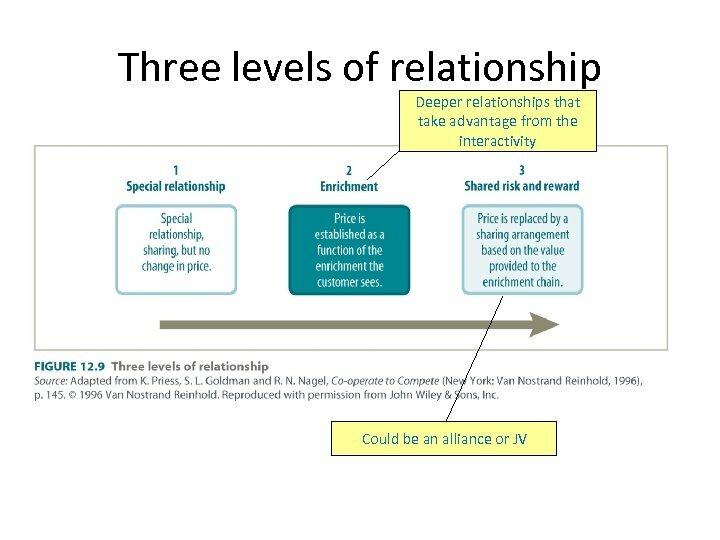 • Each company must learn the price and quality of their competitors’ offers which may provide a basis for its own strategy. 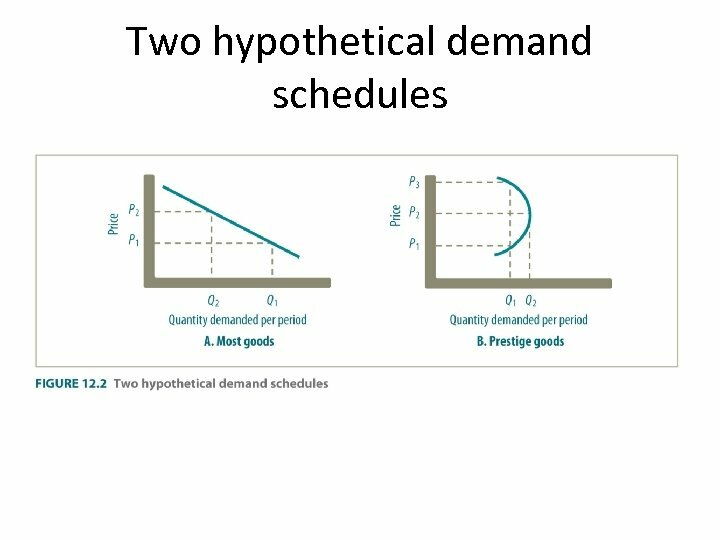 General pricing approaches • The price the company charges will be between one that is too low to produce a profit and one that is too high to produce any demand. 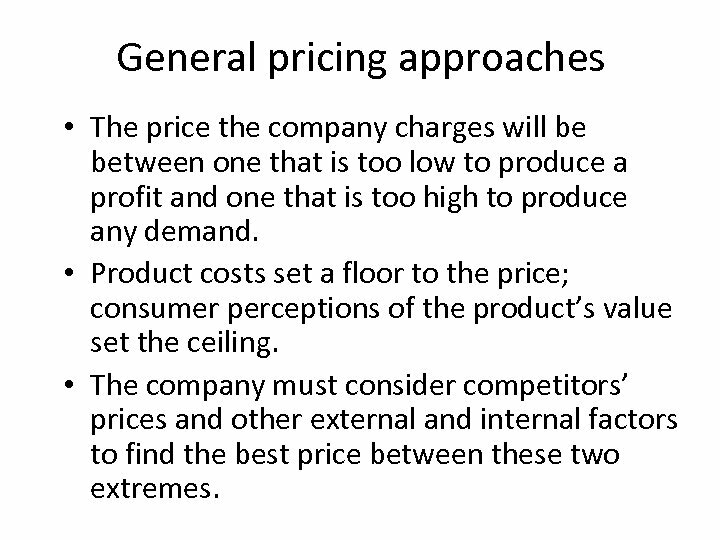 • Product costs set a floor to the price; consumer perceptions of the product’s value set the ceiling. 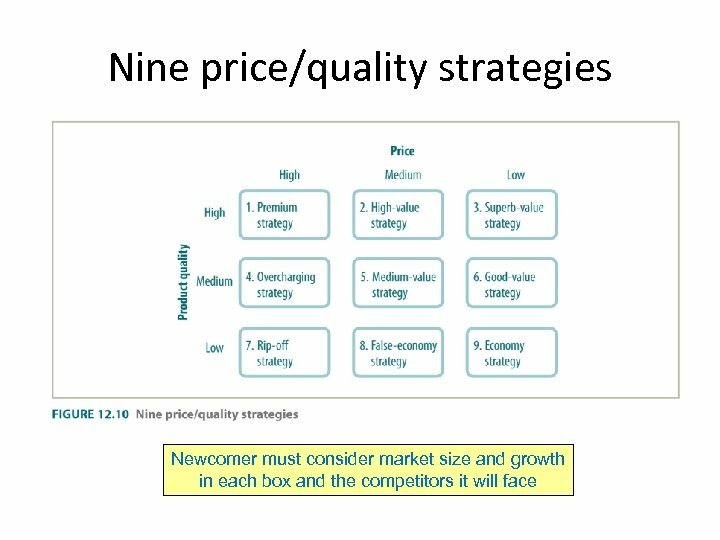 • The company must consider competitors’ prices and other external and internal factors to find the best price between these two extremes. 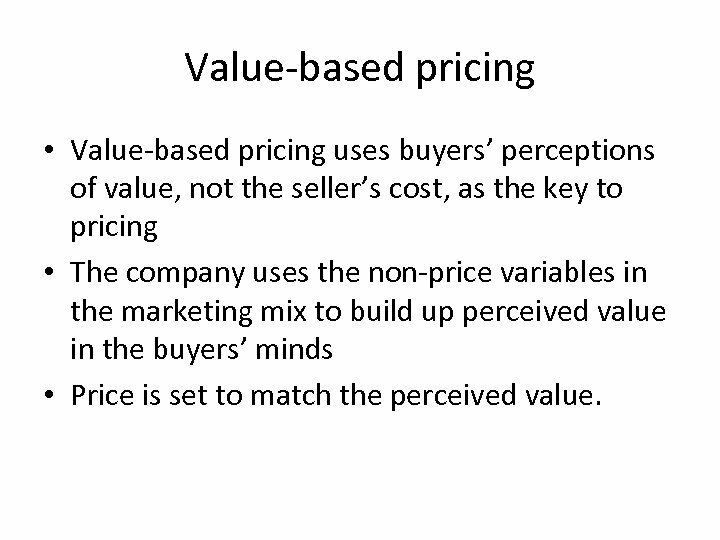 Value-based pricing • Value-based pricing uses buyers’ perceptions of value, not the seller’s cost, as the key to pricing • The company uses the non-price variables in the marketing mix to build up perceived value in the buyers’ minds • Price is set to match the perceived value. 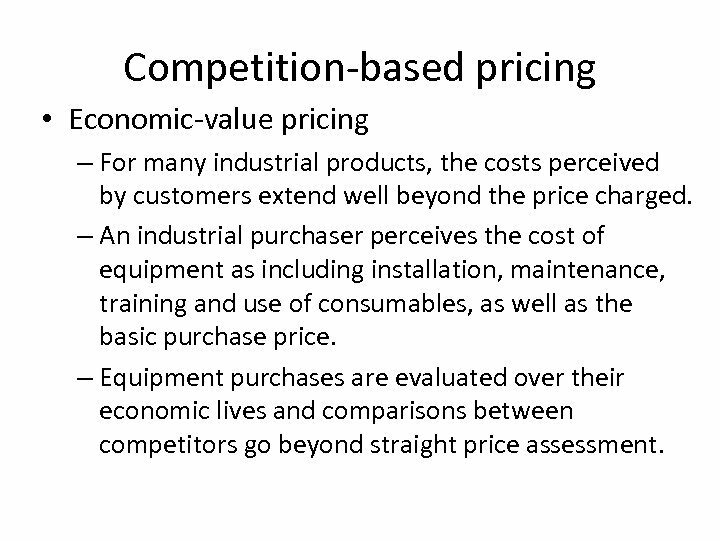 Competition-based pricing • Economic-value pricing – For many industrial products, the costs perceived by customers extend well beyond the price charged. 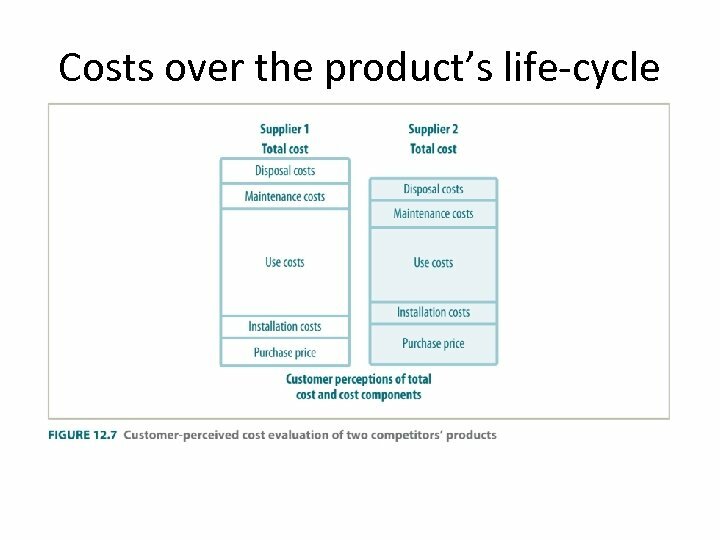 – An industrial purchaser perceives the cost of equipment as including installation, maintenance, training and use of consumables, as well as the basic purchase price. – Equipment purchases are evaluated over their economic lives and comparisons between competitors go beyond straight price assessment. 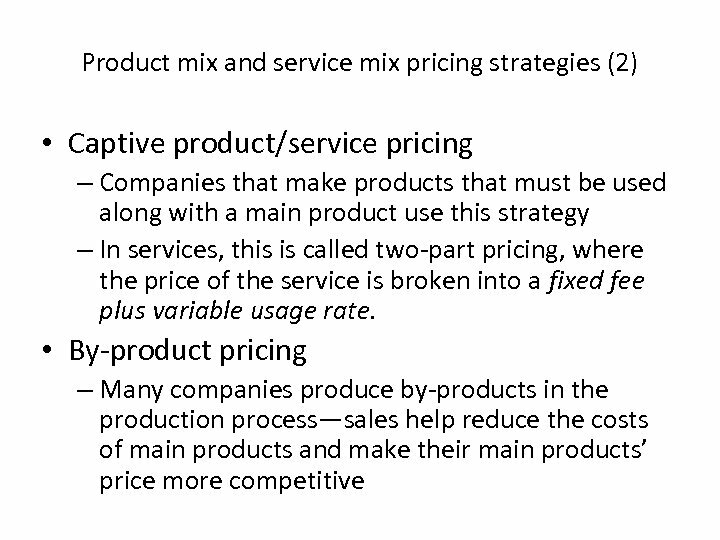 Competition-based pricing • Going-rate pricing – The company bases its price largely on competitors’ prices, with less attention paid to its own costs or demand. – The company might charge the same, more or less than its major competitors. – In oligopolistic industries that sell a commodity such as steel, paper or fertiliser, companies normally charge the same price. 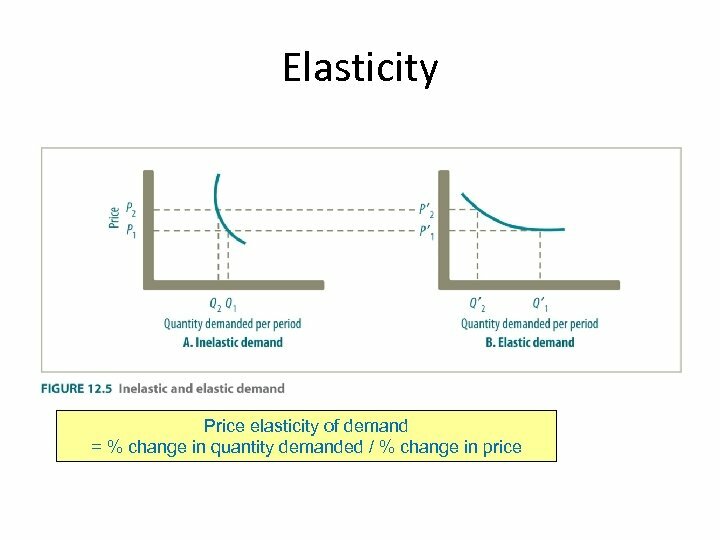 – The smaller firms follow the leader—they change their prices when the market leader’s prices change, rather than when their own demand or cost changes. 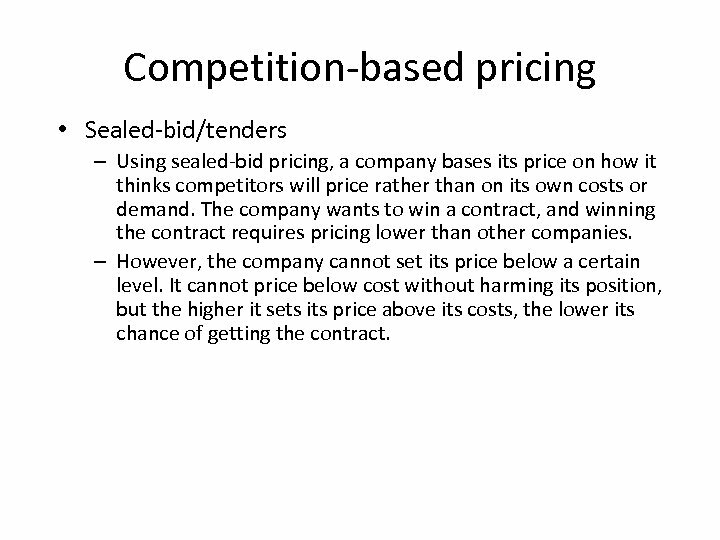 Competition-based pricing • Sealed-bid/tenders – Using sealed-bid pricing, a company bases its price on how it thinks competitors will price rather than on its own costs or demand. 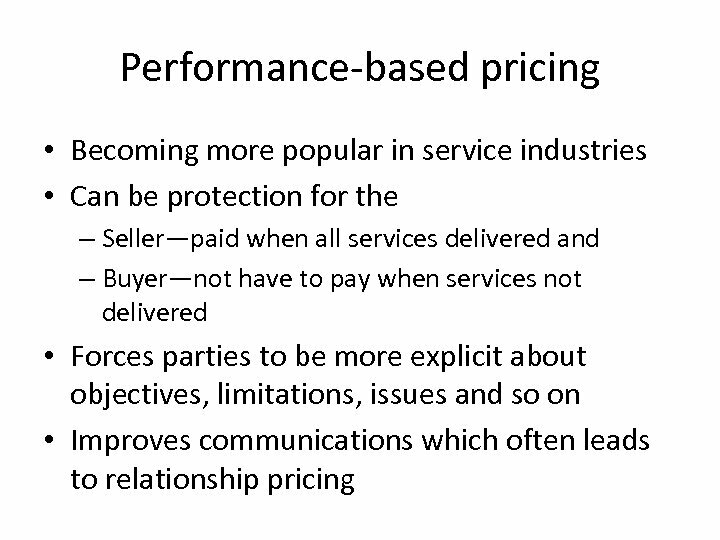 The company wants to win a contract, and winning the contract requires pricing lower than other companies. – However, the company cannot set its price below a certain level. 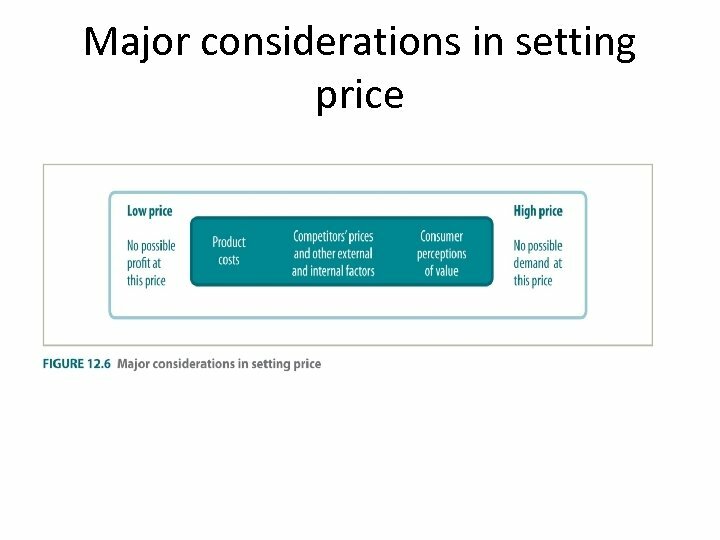 It cannot price below cost without harming its position, but the higher it sets its price above its costs, the lower its chance of getting the contract. 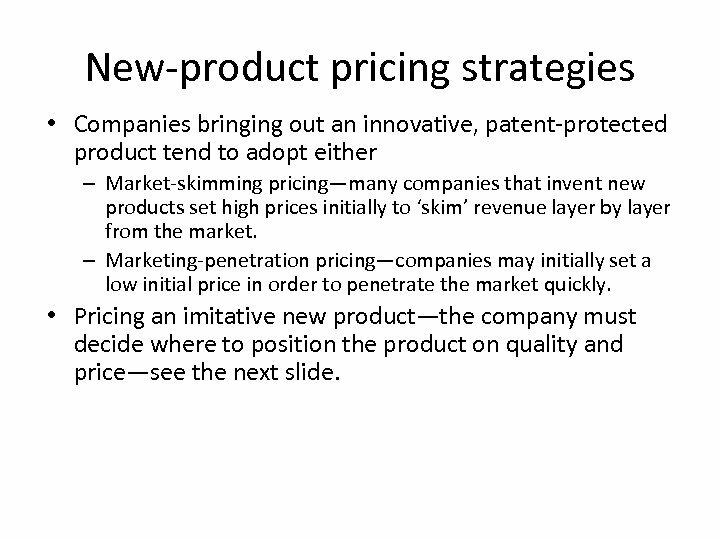 New-product pricing strategies • Companies bringing out an innovative, patent-protected product tend to adopt either – Market-skimming pricing—many companies that invent new products set high prices initially to ‘skim’ revenue layer by layer from the market. 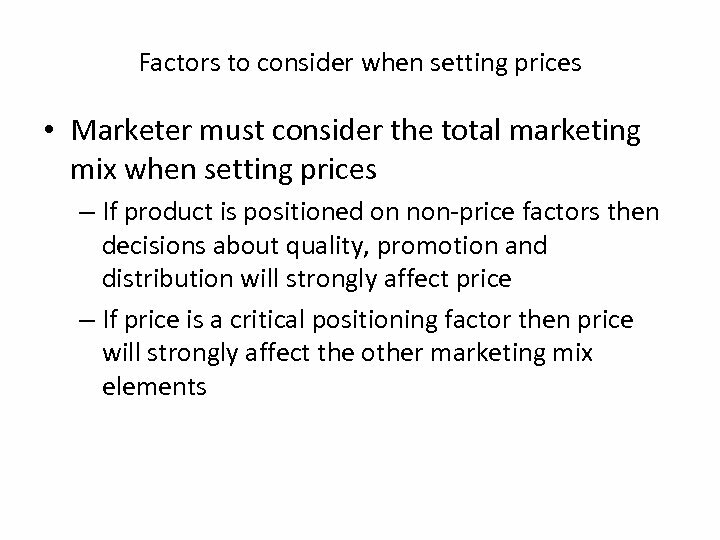 – Marketing-penetration pricing—companies may initially set a low initial price in order to penetrate the market quickly. 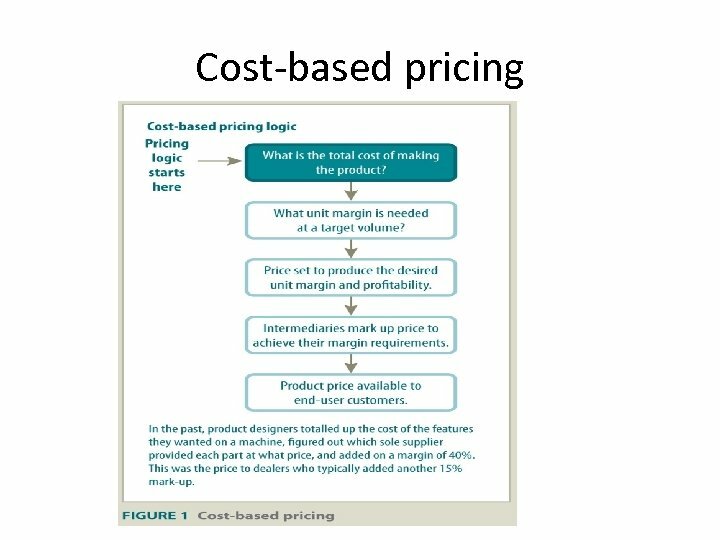 • Pricing an imitative new product—the company must decide where to position the product on quality and price—see the next slide. 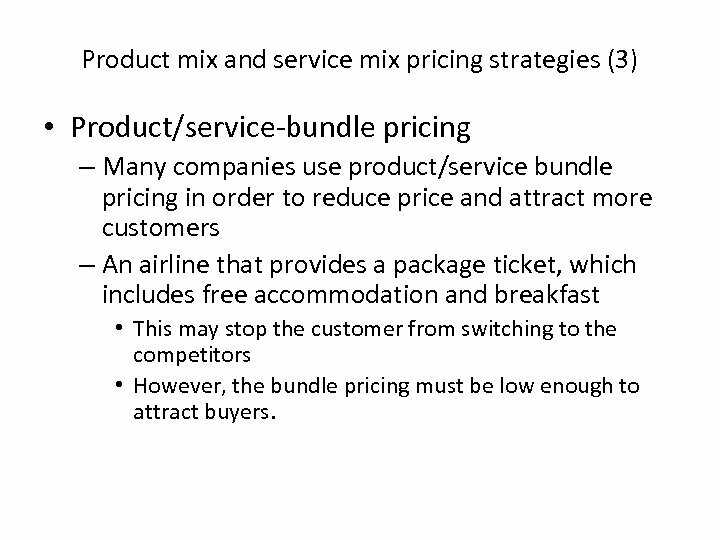 Product mix and service mix pricing strategies (3) • Product/service-bundle pricing – Many companies use product/service bundle pricing in order to reduce price and attract more customers – An airline that provides a package ticket, which includes free accommodation and breakfast • This may stop the customer from switching to the competitors • However, the bundle pricing must be low enough to attract buyers. 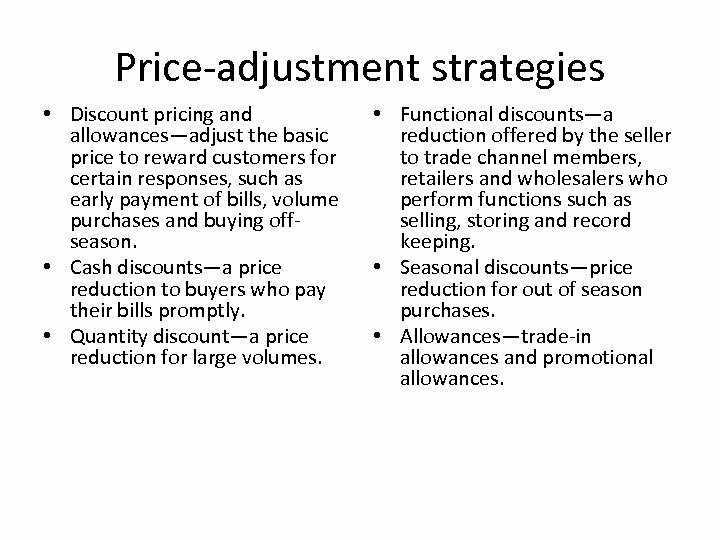 Price-adjustment strategies • Discount pricing and allowances—adjust the basic price to reward customers for certain responses, such as early payment of bills, volume purchases and buying offseason. • Cash discounts—a price reduction to buyers who pay their bills promptly. • Quantity discount—a price reduction for large volumes. • Functional discounts—a reduction offered by the seller to trade channel members, retailers and wholesalers who perform functions such as selling, storing and record keeping. • Seasonal discounts—price reduction for out of season purchases. • Allowances—trade-in allowances and promotional allowances. Psychological pricing • Price indicates something about the product. 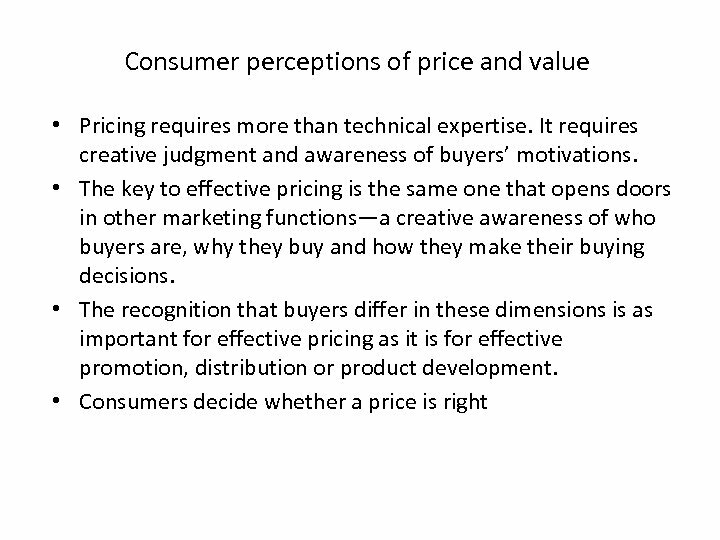 • Many consumers use price to judge quality. 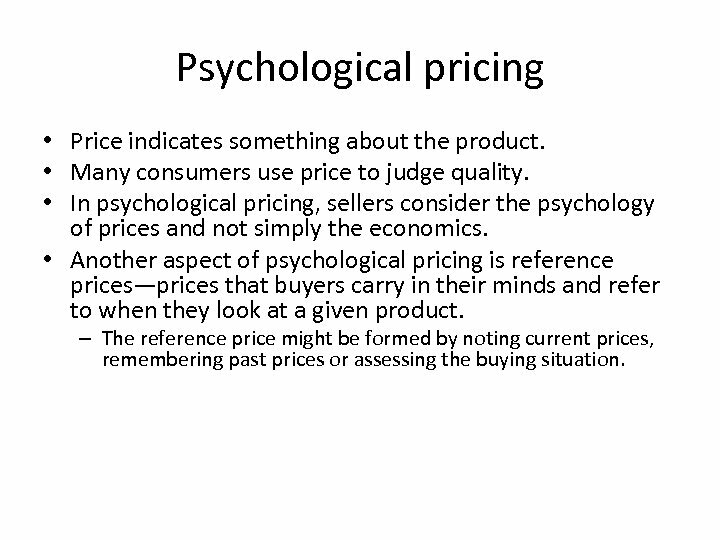 • In psychological pricing, sellers consider the psychology of prices and not simply the economics. • Another aspect of psychological pricing is reference prices—prices that buyers carry in their minds and refer to when they look at a given product. – The reference price might be formed by noting current prices, remembering past prices or assessing the buying situation. 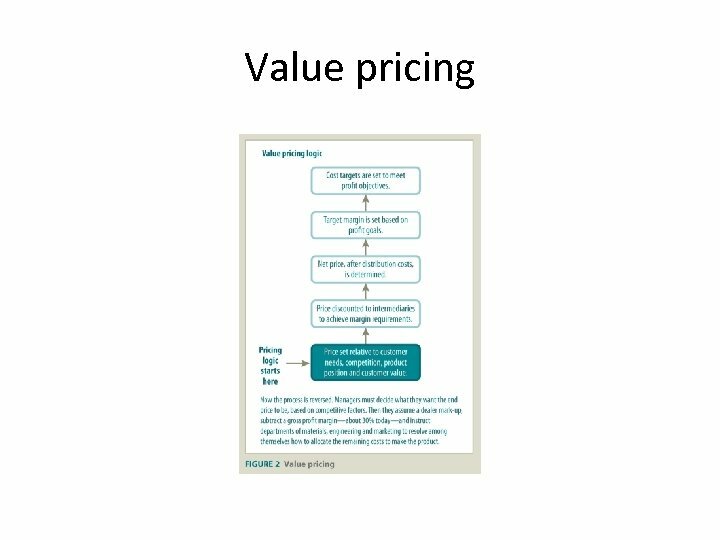 Value pricing and geographical pricing • Value pricing starts with the customer and the benefits the product creates relative to key competitors. 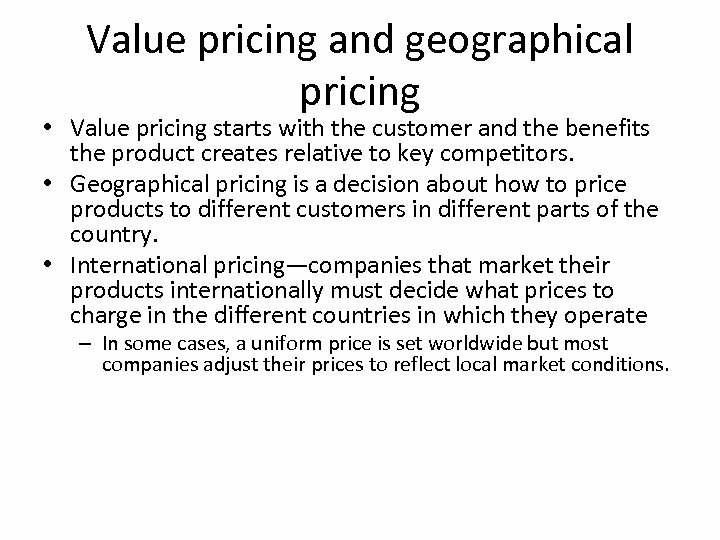 • Geographical pricing is a decision about how to price products to different customers in different parts of the country. 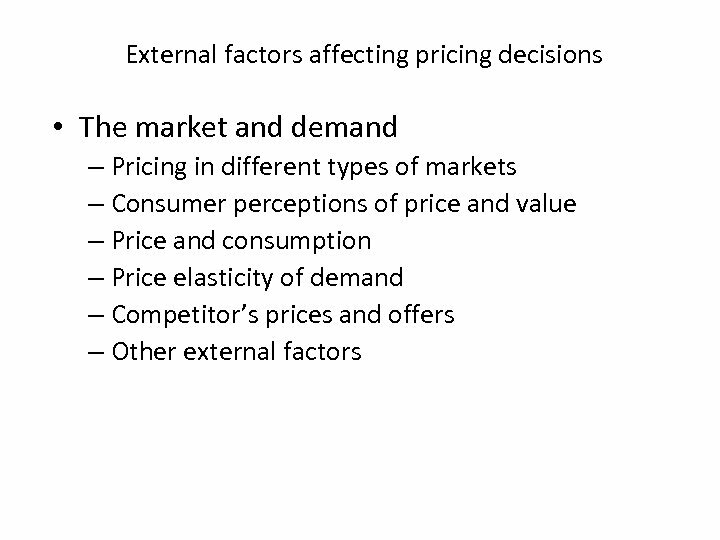 • International pricing—companies that market their products internationally must decide what prices to charge in the different countries in which they operate – In some cases, a uniform price is set worldwide but most companies adjust their prices to reflect local market conditions. 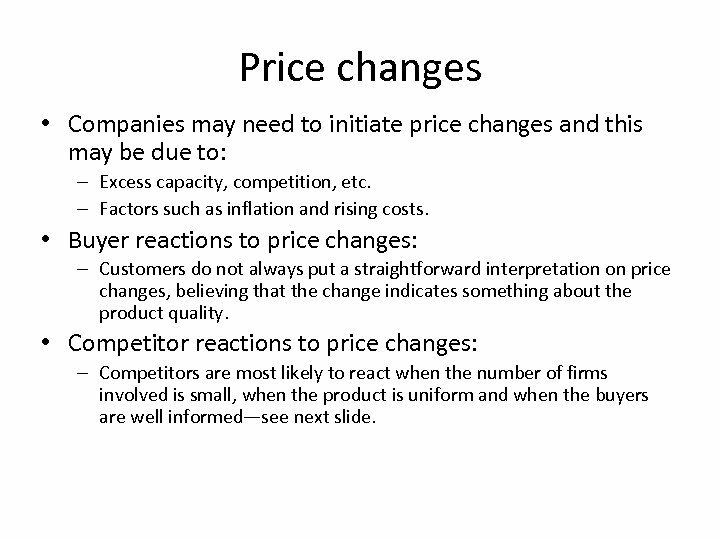 Price changes • Companies may need to initiate price changes and this may be due to: – Excess capacity, competition, etc. 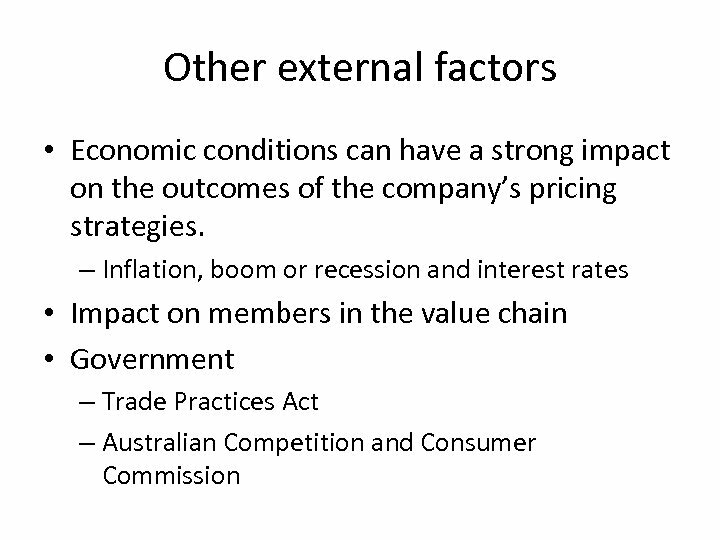 – Factors such as inflation and rising costs. • Buyer reactions to price changes: – Customers do not always put a straightforward interpretation on price changes, believing that the change indicates something about the product quality. 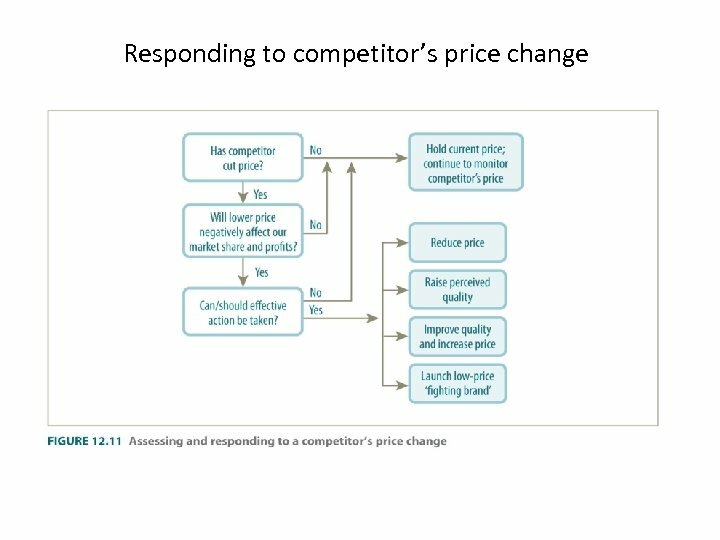 • Competitor reactions to price changes: – Competitors are most likely to react when the number of firms involved is small, when the product is uniform and when the buyers are well informed—see next slide. 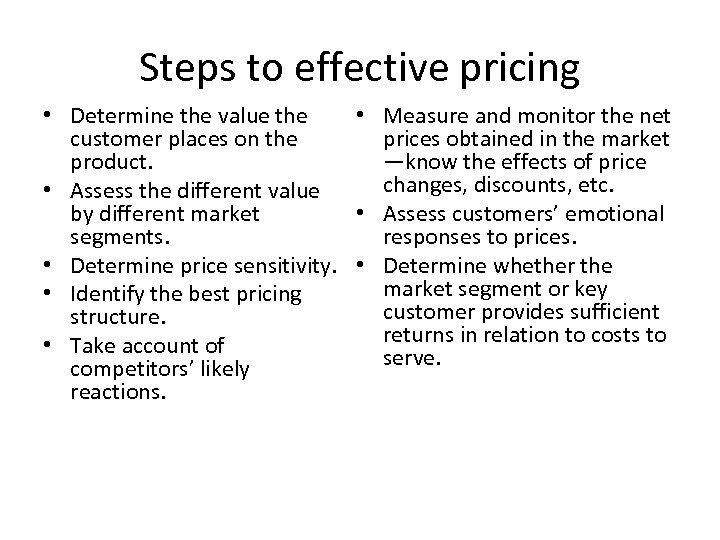 Steps to effective pricing • Determine the value the • Measure and monitor the net customer places on the prices obtained in the market product. 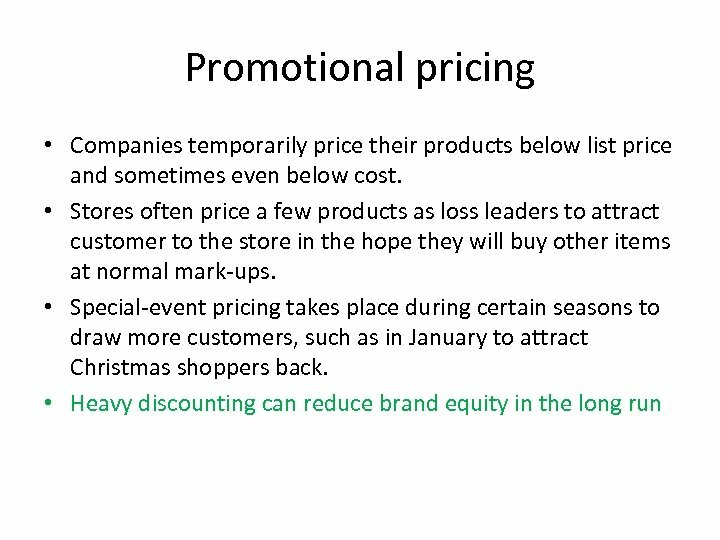 —know the effects of price changes, discounts, etc. • Assess the different value by different market • Assess customers’ emotional segments. responses to prices. 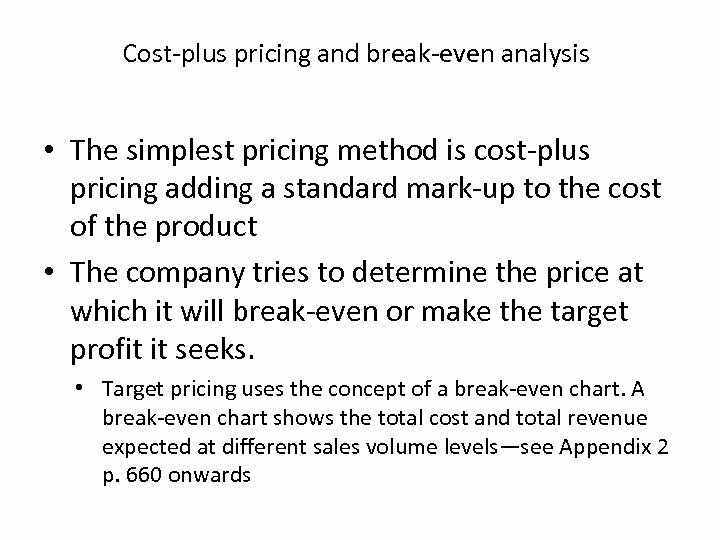 • Determine price sensitivity. 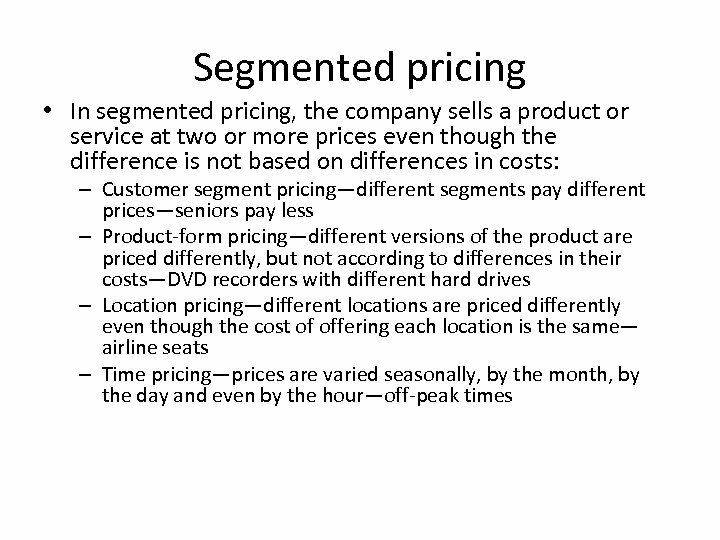 • Determine whether the market segment or key • Identify the best pricing customer provides sufficient structure. returns in relation to costs to • Take account of serve. competitors’ likely reactions. 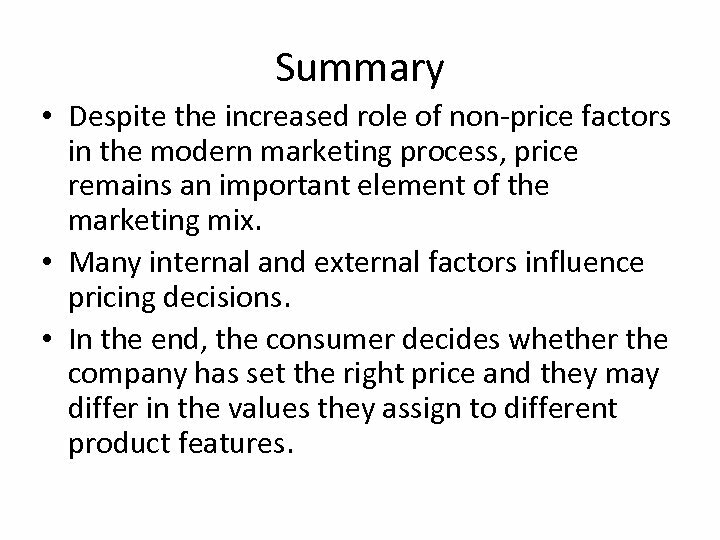 Summary • Despite the increased role of non-price factors in the modern marketing process, price remains an important element of the marketing mix. 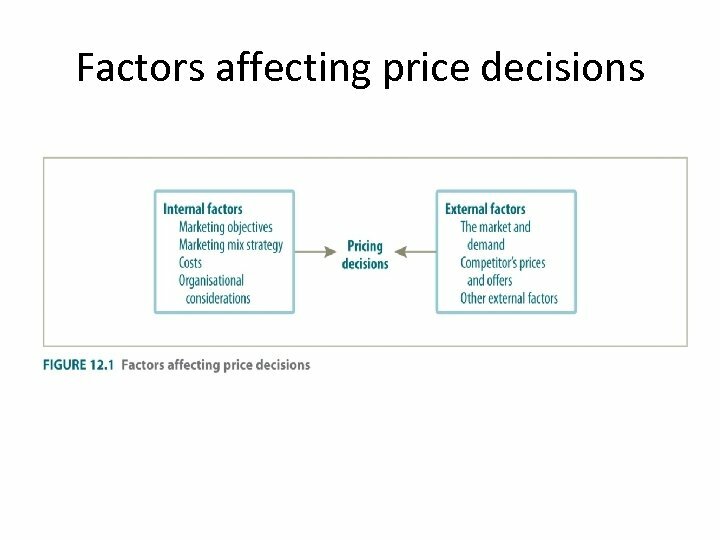 • Many internal and external factors influence pricing decisions. 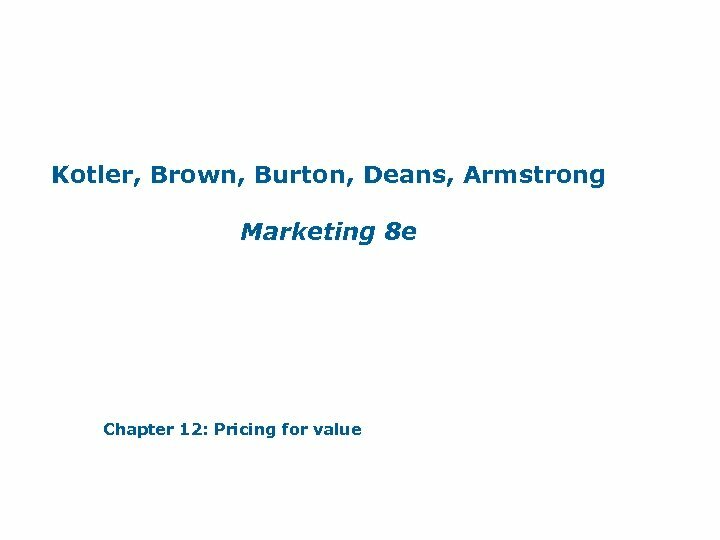 • In the end, the consumer decides whether the company has set the right price and they may differ in the values they assign to different product features.